Print the template and color in the Y y. Point out to the child which is the capital Y and which is the lowercase. Take a piece of yellow paper and allow the children to randomly glue scraps of yarn to it. I had it in my head that the yarn would go around to nicely frame the picture, but Kaitlyn had different ideas. I resisted the urge to control the process and just let her make her own artistic statement *grin*. 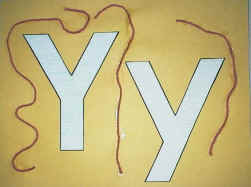 Glue the letters onto the paper (you can do this before or after you add the yarn).